Mold is extremely common in residential or commercial buildings. Are you taking the proper precautions to ensure your building is safe? Mold can be found everywhere and is not dangerous in small doses. When mold colonies multiply and spread, serious health risks can occur. People exposed could experience nausea, dizziness, headaches or worse. Multiply that by a building full of occupants and you could be in serious trouble. Testing for mold is the best way to determine if mold levels have reached a point of hazardous levels and if your building has a moisture problem. When a test comes back with high concentrations of mold, the first step in restoring your property’s indoor air quality is to fix the source of moisture. AF Environmental has a proven process in place to test for mold in residential, industrial, educational, government and commercial buildings. Since mold can be found everywhere, our goal for the test is not to identify if mold is present, but if it has reached a level of concern. Equipped with the proper tools and equipment, our team can successfully test for mold and if results come back positive, can discuss plans for remediation as well. Certified by the IICRC, our team of technicians are highly trained to collect the best samples. Our goal is to illustrate what is going on behind the walls and deliver a test that is accurate and fair to the building conditions. AF Environmental services the Dallas/ Ft. Worth metro area. Established in 2004, our service area includes but is not limited to the counties of Tarrant, Parker, Dallas, Denton, Collin, and Johnson. AF Environmental services a wide range of clients. When you choose AF Environmental, you can be confident that regardless the complexity of your mold testing project, we can handle it with ease. We are licensed, bonded and insured to take on projects of all sizes. When you choose AF Environmental, you are hiring a qualified professional for your mold testing. When toxic mold begins to reach harmful levels, it is time to act. The first step is to reach out to a company who is certified and qualified to conduct a proper mold test. At AF Environmental, we are equipped with the proper tools such as thermal imaging cameras, calibration pumps, and other tools to identify the types of mold within your building’s environment. The most common of the tests we do our air quality tests will determine if high levels of mold is present, which species mold is found and estimated count of spores within the affected area. We deliver this information via a laboratory report based on the samples we take during the initial test. In addition to testing for air quality, we also can conduct a test that will help us determine mold levels behind walls and within the hidden areas of your building. Utilizing swab testing methods as well as bulk sample mold testing, our team can provide you a thorough report. Upon completion of mold remediation, it is required by OSHA (Occupational Safety Health Association) to perform a mold clearance test. This test provides the data necessary to show that mold remediation has taken place and that the indoor air environment has been return to a safe and habitable level. Long term exposure to mold can create irreversible health conditions. Although mold is found virtually everywhere, it becomes dangerous in high concentrations. That is why testing for hazardous levels of mold is essential in keeping the indoor air quality of your building safe. 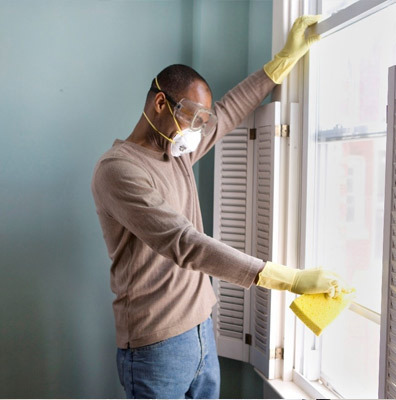 Available 24/7, AF Environmental has worked with both home and business owners to test for high levels of mold and help develop a plan of action if the results came back positive of harmful levels. AF Environmental services the Dallas/ Ft. Worth metro area. Established in 2004, our service area includes but is not limited to the counties of Tarrant, Parker, Dallas, Denton, Collin, and Johnson.